We believe that worship, witness and service are one and the same. Worship is a response to our calling as individuals — and a reflection of our commitment as a body of believers. Join us, and find an experience that’s warm and familiar, thoughtful and intentional, engaging and challenging. We recognize baptism as the cornerstone of Christian commitment. We’d love to welcome you into Christ’s body and into this family. 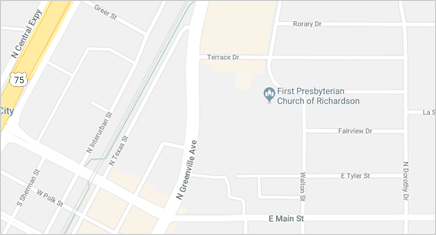 If you want to be baptized at First Presbyterian Church of Richardson, please contact the Church Office to arrange a meeting at your convenience. For membership information, please click here. As a congregation of the Presbyterian Church USA (PCUSA), First Presbyterian follows a lectionary that outlines scripture readings for specific days and occasions. Sermons at First Presbyterian are intended to make the lectionary material real and meaningful in the lives of our congregants. Members and non-members alike are welcome to celebrate marriage at First Pres. Just contact the church office, and let’s create a meaningful, memorable ceremony and reception for you and your family. The Sanctuary and Chapel are open to members and their families for funerals (with remains present) and memorial services (without remains present). The worship ministry at First Pres works with the pastor and staff to plan and execute every facet of the worship experience. Our desire is to create an environment where members and guests can commune with God and enjoy fellowship with other believers. If you’d like to learn more about how worship happens at First Pres — or if you’d like to contribute your time and talents to preparing for worship, please contact the ministry chair.